The best characteristic to describe the English Springer Spaniel is playful. They can be very at home running and playing all day long outdoors, and settle inside their homes at night enjoying their families. They simply adore their families and will need their fair share of activity during the day. If they do not receive adequate time to exert themselves, they do have a tendency to act up simply out of boredom. They are one of the most affectionate dog breeds and are great at playing with other dogs and with children as well. Their adaptable attitudes make them a cinch to train as pups and they also can learn to be trained to excel as a watchdog also. Loads of energy and even welcome stranger into their homes are just two of the main reasons so many seek the English Springer Spaniel as their favorite family pet. All English Springer Spaniels are very enthusiastic and energetic creatures. They are natural hunters and will crave that hobby daily. They will require a family in a loving home that provides them with plenty of affection and time to blow off some of that high energy they possess. They are most content in a home that allots them the freedom to go in and outdoors as they please all day. The do need a fair amount of attention paid to their fur coats with weekly brushing and clipping as needed. The English Springer Spaniels that are show hounds will need more attention to their coats than the ones who are domesticated canines. Some health ailments that may develop in an English Springer Spaniel can be related to CHD, otitis externa, elbow dysplasia and phosphofructokinase. Minor health infractions can be in the form of PRA and retinal dysplasia. In some rare occurrences, experts have noted they have seizures, gastric torsion, patellar luxation, entropion and rage syndrome. These findings were not in all or event he vast majority of the English Springer Spaniel breed, just in some. Recommended screening by the vet for this breed involve eyesight tests, hips, hips and their elbows as well. The average lifespan for this type of Spaniel is from ten to fourteen years long. They generally weigh between forty to fifty pounds as full grown canines. 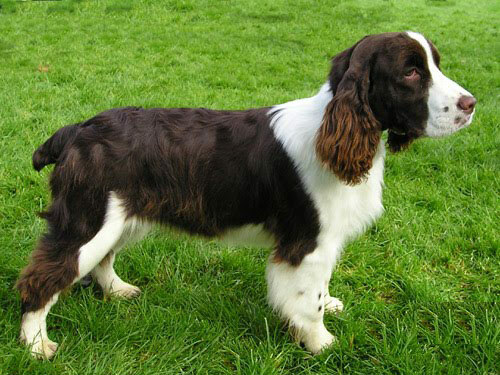 Once chased by greyhounds, the English Springer Spaniels originated from England around the 18th century. The general category of Spaniels were actually seen in the 15th century, they were then referred to as “land spaniels” and were utilized for their exceptional bird hunting capabilities. They are also known for their bird flushing and retrieving talents as well. While they have been around for quite some time, this specific type of Spaniel did not receive their acknowledgment by the AKC until the very early 1900’s. A club for them has been since formed in the United States as the “American Spaniel Club” and currently they are a popular household pet and used commonly in dog shows.